Subterranean worldcore played by a tribe of angry moles in group therapy. 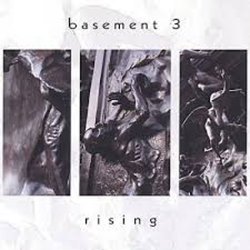 Basement 3 is where primal meets urban—-it is flavors and rhythms of world music fed by the fury of punk, industrial, and avant garde jazz, all served with a side of pop. It sounds like what might happen if Maynard James Keenan, King Sunny Ade, PJ Harvey, Nusrat Fateh Ali Khan, and John Coltrane got drunk, picked up Morphine(the band and/or the drug), and crashed a Portishead concert. Kenny became intensely involved in the San Francisco Bay Area Music scene in 1982 when he began playing jazz saxophone at local coffeehouses. Also an accomplished guitarist, Kenny was asked in 1984 to join Dot 3, a high energy, funky, tribal post punk outfit that would gain much critical acclaim due to it’s intense live shows, blending of world music with punk, and it’s unique instrumentation(horns, chanted vocals, stand-up drums, Chapman stick, and guitar). Dot 3 quickly became the most popular local support act for touring alternative acts of the time such as The Red Hot Chili Peppers, Fishbone, Faith No More, Firehose, and Level 42. After countless near signings and 6 years of furious gigging, Dot 3 collapsed in frustration, but not without leaving a indelible mark on Kenny’s musical aesthetic. The struggle to seamlessly blend multiple musical styles with power and originality would be a goal of Kenny’s forever. The next decade would see Kenny playing in multitudes of bands and writing/performing horn arrangements for a variety of projects, including releases on MCA, Warner Brothers, and Island. During this time, Kenny played with 70’s funk cover band Curveball, whose floating list of superb musicians included Arion Salazar of Third Eye Blind, Brain of Primus, Jay Lane of The Charlie Hunter Trio and Primus, Jeff Gomes of MIRV, Mike Urbano of Smashmouth, and Ray White of Frank Zappa’s band. Kenny also played sax, guitar and tin whistle in alt folk rock band, The John Singer Band, which spawned Counting Crows’ keyboardist, Charlie Gillingham. In the latter half of the 90’s, Kenny became involved in the Bay Area reggae and ska scene when he was simultaneously asked to join Neosoreskin, headed by ex-Skankin’ Pickle front man, Mike Mattingly, as well as reggae band Dub Nation. Dub Nation quickly gained recognition as one of the “best American Reggae bands,” as it played some of the biggest reggae festivals in the United States and landed opening slots for the likes of Chris Isaac, Los Lobos, Ani Difranco, and Pete Escovedo. As the band’s notoriety sky-rocketed, they became the back up band for many Jamaican acts touring without bands, such as Justin Hinds, Yami Bolo, JC Lodge, and most notably, Judy Mowatt. Dub Nation received a California Music Award for their 1998 release Let the Truth be Known, which featured reggae stars Pato Banton, Tony Chin, and Earl “Chinna” Smith. In the midst of all their popularity, with air play beginning on major radio stations in New York and San Francisco, as well as numerous rave reviews in the biggest reggae rags, Dub Nation fragmented due to internal conflict. About 2 years later, Neosoreskin would call it quits due to lack of acceptance by music industry and audiences alike. With no time off, Kenny joined the newly reformed ska outfit, The Brownies and Dub FX, a band resurrected from the ashes of Dub Nation. Between all these projects, Kenny has been working on a solo project called Basement 3, whose first release, Eating the Cannibal, was completed in 1999. The content of this CD saw Kenny fusing the rhythms of world music, the aggression of punk, and the colorings of industrial, along with jazz-like horn riffs, complex harmony, and pop forms. With the exception of ex-Dot 3 drummer Mike Freitas and a couple of guest appearances, the album was entirely written, performed, recorded, and produced by Kenny in his home studio. Quitting work in spring of 2000, Kenny began recording the CD “Rising,” which had originally been scheduled for release in mid 2001. Due to complexity and scope of concept, the CD took almost an extra year to complete. As it turned out, the CD became somewhat of a “journal,” capturing a complete period of dramatic life change for Kenny. “Rising” became the auditory depiction of Kenny moving from a mind set of perceived victimization to a place of empowerment and self-acceptance. It is about seeking one’s own truth and rejecting, if necessary, the sometimes nearly impenetrable molds cast upon individuals by a society that is sometimes too lazy or scared to examine it’s outdated beliefs and traditions. Adding to the lengthy recording process was the inclusion of a large number of guest musicians, which helped to give the CD a much more open feeling than “Eating the Cannibal”. On “Rising,” Kenny has really started to find himself both musically and personally. A perfect balance of harmony and aggression. #8 rocks! A very diverse listening experience. Well textured instrumentally, with a perfect balance of fast to slow tempos. Tender, fanatic, simmering, blatant. The musicianship echoes the talent of such famous musicians: David Gillmore, David Boey, Midnight Oil, Nirvana, Redhot Chili Peppers, ….